When it was over, after Devin Booker had scored the last of his franchise-record 70 points, Suns veteran Tyson Chandler found his teammate on the court and embraced him. The Suns are in a free fall. Counting Friday’s 130-120 loss to the Celtics at TD Garden, they have lost seven in row. Most fans are more interested in the draft lottery than this season’s final few weeks. For one night, however, Booker lassoed their attention once more. 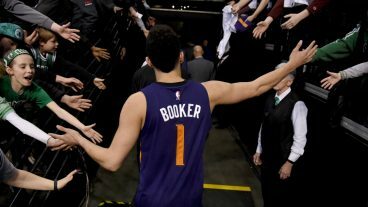 In front of 18,624 fans, Booker became the sixth player in league history to score at least 70 points in a game, joining Wilt Chamberlain, Kobe Bryant, David Thompson, Elgin Baylor and David Robinson. At 20 years and 145 days, he also became the third youngest to record a 50-point game, behind Brandon Jennings and LeBron James. Just a few days ago, Booker was in a slump. Entering Thursday’s loss at Brooklyn, while battling ankle soreness, he had made just 13 of 55 over three games. Against the Celtics, Booker looked more like himself. Once he got rolling, he didn’t stop. He hit a bank shot in transition. He canned a jumper and was fouled. He scored in the post. Overall, Booker sank 21 of 40 from the field and 24 of 26 from the foul line. He had 19 points at halftime and a career-high 42 through three before exploding for 28 in the fourth. The two of them sat next to each other on stage. They laughed, they joked, they acknowledged each other’s place in the franchise’s lore. As they did it, a fraught chapter in Lakers history closed. Moments later, the crowd chanted a countdown, then a gold cloth fell, revealing a bronze sculpture hanging from a Staples Center awning, depicting O’Neal hanging from a rim after dunking with both hands, his feet swinging into the air. On Friday afternoon, O’Neal’s statue became the seventh at Staples Center. It hung just behind Jerry West’s statue, and not far from Magic Johnson’s. Hockey players Luc Robitaille and Wayne Gretzky, late broadcaster Chick Hearn, and boxer Oscar DeLa Hoya also have statues outside the arena. LeBron James said he suffered a scratched cornea in his right eye in Friday’s 112-105 win over Charlotte after being examined by a Hornets team physician. James, who scored 32 points in 40 minutes, could not keep his right eye open during his postgame interview session and said his vision was blurry. He was poked in the eye by Jeremy Lamb on his way to a layup with 31.2 seconds left in the third quarter. James returned to the game, and in the fourth quarter fell hard on his lower back after he was fouled on a layup attempt by Michael Kidd-Gilchrist. The Cavs play the Wizards Saturday night at The Q. They are 0-6 without James this season and hold just a one-game lead over Boston for first in the East. The Hornets’ physician who examined James after the game returned to the Cavs’ locker room later Friday evening to administer some eye drops. James called timeout for extra time to shake off the injury, and converted the free throw afterwards.